While employers may utilize credit reports and other screening devices, such as criminal background checks, during the hiring process, the Fair Credit Reporting Act (FCRA) imposes strict rules and procedures that must be followed. The failure to do so, either through willful acts or negligence, can result in liability to employees and job applicants. The failure, before taking any adverse employment action based on a consumer report, to (1) provide a copy of the report, (2) advise the employee or applicant of the right to dispute the report, (3) provide information regarding how the dispute may be disputed. 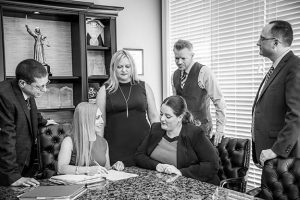 Where these procedures are not followed, employees or applicants may have a claim under the FCRA, and may be entitled to damages, even if they are hired. If you feel that your employer, or a prospective employer, has not followed the proper procedures relating to credit or other background checks, or if you are an employee that wishes to ensure that you are in compliance with this highly technical law, we are here to help. For more information on the FCRA, please visit our FAQ page.